The Free Library was founded with the goal of helping Philadelphians achieve personal enlightenment, and has continuously evolved to reach this goal in an ever-changing city and world. To further this bedrock goal, we have created the Division of Cultural and Civic Engagement, a new office that aims to enrich the public life of Philadelphia through cultural engagement, civic dialogue, and the free exchange of ideas! The Division is the product of a collaborative, imaginative process with staff seeking ways to expand our enrichment opportunities for adults in Philadelphia. Helmed by Andrew Nurkin, Deputy Director for Enrichment and Civic Engagement, the Division of Cultural and Civic Engagement supports existing library programs, including the renowned Author Events series, programming at The Rosenbach, offerings at the Parkway Central Library and neighborhood library locations, and seeks to expand their reach and scope while serving as a springboard for new programs and initiatives. This new center of activity has a particular focus on initiating more civic programming in our neighborhood libraries, offering adults in every community as many opportunities for enrichment and advancement as we have steadfastly provided for our city’s children. Through concerts and performances, exhibitions for new audiences, classes, reading groups, artistic workshops, and more, the Division seeks to build a sense of community engagement at a very local level. "We want Philadelphians to be inspired by art, literature, and culture when they walk into their neighborhood library, as well as to be in dialogue with people of different perspectives," says Nurkin. "By sparking curiosity and fostering connections, we hope to inspire library users to learn more, ask more questions, and then share their vision for our city, state, and country." Community conversations are at the heart of this work. Tapping into issues that affect the immediate neighborhood, Ramonita G. de Rodriguez Library has brought stakeholders together for conversations about gentrification. Drawing on the energy of the Author Events Series at Parkway Central Library, the new Authors Up Close program brings local and regional authors to neighborhood libraries for salon-style conversations. The Rosenbach’s In Conversation With series also offers audiences a chance to share thoughts and questions with literary and cultural luminaries, while the ongoing This Is What Democracy Looks Like series has tackled voter registration, information, and engagement across the city ahead of the November 6th midterm elections. Programs like these, as well as the city’s Poet Laureate program—which now falls under the Division of Cultural and Civic Engagement’s umbrella—forge bonds and promote lifelong learning. The Division is also committed to creating and supporting programs that empower Philadelphians, like the Free Library’s offerings for new Americans and its Prison and Re-entry Services. In a time when many in our community are seeking to become more civically engaged, the Free Library is working to create more access to library and social services, non-partisan political information, and civic resources for all Philadelphians. 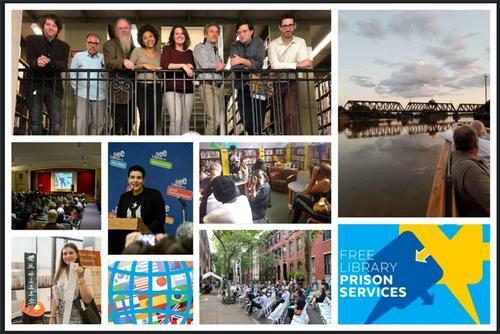 Coordinating these incredible programs and services out of one office allows the Free Library to ensure that quality programming reaches every neighborhood—providing all Philadelphians rich, varied pathways to personal enlightenment. Stay tuned throughout the week for more information – here on our blog and on social media! – about the Division of Cultural and Civic Engagement and its important work in our city! The Division of Cultural and Civic Engagement is a new office that aims to enrich the public life of Philadelphia through cultural engagement, civic dialogue, and the free exchange of ideas! I'm on the Arts Committee at the William Way LGBTQ Community Center, as well as an alumnus of the Pennsylvania Academy of the Fine Arts. I have curated many group exhibitions and exhibited artwork in Philadelphia. I would love to discuss ways the Community Center and the large network of artists and arts organizations I am involved with can create programs and exhibitions with the FLP. Having a Queer-American Art Exhibition in June next year to recognize Stonewall 50th anniversary, an historic milestone in the Queer community worldwide, would be a significant way to support Queer-American art and culture. I look forward to discussing possibilities. Janus Ourma MS., MA, artist, curator and independent researcher. Add a Comment to Introducing the Division of Cultural and Civic Engagement!